Give your high heels some TLC with a thorough cleaning. Your high heels can add the finishing touch to your little black dress or give your jeans some class, but if they’re looking a bit grungy, your entire look can be a bust. Whether your high heels are suede, leather or satin, give them a good cleaning when they get dirty to keep your stylish reputation intact. But don’t just grab a rag and start scrubbing. High heels need to be cleaned according to the material. Let the high heels dry if they’re wet at all. Trying to clean wet suede can actually make them dirtier. Rub a pencil eraser over any dirt marks on the suede. Use a light back-and-forth motion when rubbing. Scrub over the suede material with a clean, dry toothbrush to restore the nap that was flattened during cleaning. Brush briskly over the suede until the nap has been restored. Wipe down the high heels with a dry rag to remove dirt and mud from the surface of the leather. Moisten a sponge with warm water. Wring out the sponge well so it’s just barely damp. Wipe down the leather part of the high heel until all of the dirt is gone. 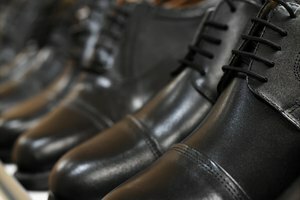 If the shoes are really dirty, it might be necessary to use a clean sponge for each shoe or thoroughly wash the sponge before moving on to the next shoe. Moisten a rag with warm water. Dip it into baking soda and use this to gently scrub off any scuff marks from the high heels. Wipe over the shoe with a clean, damp rag to remove the baking soda residue. Buff the high heels with a dry rag. 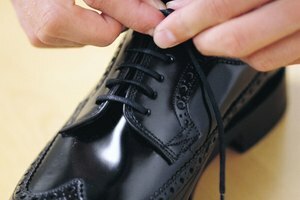 Apply leather conditioner to the shoes after cleaning. Follow the manufacturer’s instructions for using leather conditioner, as this varies among products. Conditioning the leather helps restore moisture lost during the cleaning process. 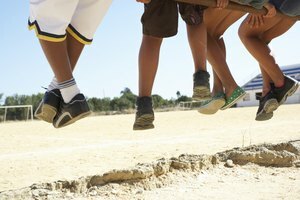 Wipe off the shoes with a dry rag to remove dirt and debris. Moisten a rag with cold water. Dab the rag onto any dirty spots of the shoes, using a downward motion and following the grain of the satin fabric. Use a clean part of the rag after each blot to avoid reapplying dirt. Don’t rub the rag over the fabric, as this will likely spread the dirt around on the shoes. Put a drop of dish soap onto a damp rag if the dirt isn’t coming off with water alone. Rub the rag together to create a lather, then use this to blot the dirt off the shoes. Rinse the soapy areas of the shoes by blotting with a clean rag and cold water. Blot the shoes with a dry towel to soak up any moisture. After cleaning the fabric part of the high heels, use a damp rag to wipe down the high heel itself and the sole to remove dirt, mud and debris. Parker, Kimbry. "How to Clean High Heels." Synonym, https://classroom.synonym.com/clean-high-heels-14753.html. Accessed 25 April 2019.